Most bodies in this world do not have brains and the minority of animal species that do have brained bodies are descendents from species with more distributed or decentralized nervous systems. Thus, bodies were here first, and only relatively late in evolution did the bodies of a few species grow supplementary organs, brains, sophisticated enough to support a psychological life. Psychological life therefore from the beginning was embedded in and served as a tool for corporeal life. This paper discusses the semiotically controlled dynamics of bodily existence that has allowed the evolution of these seemingly ‘unnatural’ mental and even linguistic kinds of species. It is shown how the skin, on the one hand, makes us belong in the world, and on the other hand, is part of the huge landscape of membranes across which the semiotic self incessantly must be reconstituted. The discussion moves on to the intracellular world of signal transduction through which the activity of single cells are put to service for bodily needs. The paper further considers the mechanisms behind homeostasis and the semiotics of the psycho-neuro-endocrine integration in the body. The concept of semiotic emergence is introduced and a holistic marker hypothesis for why some animals may have an experiential life is suggested. 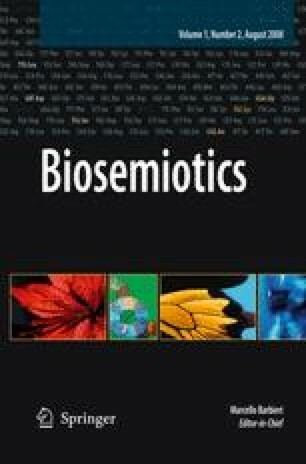 This paper is prepared on the basis of multiple extracts from my book ‘Biosemiotics. The Signs of Life and the Life of Signs’, released by the Scranton University Press in Fall 2008.